For as long as she can remember, Christine Blacksworth's father traveled once a month for four days to a small down outside of Chicago for, what she and her mother always believed was rest and relaxation at their family's cabin. When her father dies in a car accident one night, she is devastated. She is even more shocked when her father's attorney informs her that he has left money to a woman named Lily Destano. She realizes then that he has been having an affair for the last 14 years. She travels to the town to confront Lily Destano and give her the money her father had willed to her and then hopefully never have to deal with her again. When she arrives in the town of Magdelena she discovers that Lily is not her father's mistress; but his daughter. It isn't until Christine meets Lily that she realizes how special she is that everything changes in Christine's world. Everything she thought she knew and loved is brought into question and she finds herself drawn more and more to this "other" family her father had and farther away from her mother and the boyfriend she realizes she doesn't love anymore and probably never really has. 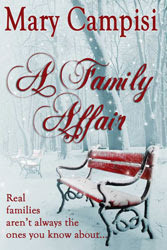 A Family Affair is a heart warming story that takes a different track than most "he had an affair" stories. In the places where you expect to find animosity and bitterness you instead find compassion, loyalty and love. You realize that maybe there is no "good and bad" side; but rather a "good and better" side to the the story. There is fault and blame on both sides to be sure as well; but as Christine becomes more and more a part of life in Magdalena, she begins to understand her father in a way she never thought possible. As much as I enjoyed the story, I did find it a bit predictable. It became very clear early in the story what the outcome was going to be even through the few bumps in the road along the way. In some ways I wished that her father, Charlie, had not died so early in the story. I would have liked to have seen the confrontation between Charlie and Christine as father and daughter. I also found that Christine was a little too accepting a little too quickly of her father's indiscretions. I kept waiting for the true anger that should have been associated with a discovery like this to emerge; but it never did. This is the perfect read if you've just finished a long or complicated story and need something easy and lighthearted. Don't expect it to be any more than that because you will probably be disappointed.